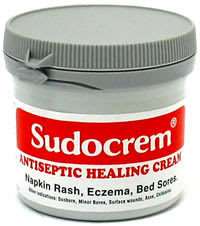 I have had a few spots come up the last few days so tonight i have slapped on some sudocrem and will leave it to work its magic overnight....I shall be spot free in the morning I hope :) For those that dont know sudacrem is nappy rash cream but works wonders on spots! Whats even better is you can buy it absolutely everywhere, boots, superdrug, any supermarket even the corner shop and its only about £2-£3 for a large pot which lasts ages. You only need a tiny amount as its a thick consistency. Made primarly for babies its going to be very kind to skin. I love it that much i was thinking of buying a smaller size pot to keep in my bag for emergencies! If you havent already tried it i urge you too! It smells of lavender and I have noticed that lavender is one of the ingredients, so I wonder if lavender based products or lavender facial oil is any good?